ADA Compliant Truncated Domes with Peel and Stick Technology - Surface Applied ADA Pads for Asphalt and Concrete Surfaces -----> NOTE: This size meets the California requirement for a minimum 3-foot depth for truncated domes. • This pre-molded tactile truncated domes sheet is composed of fiber-reinforced, polymer-modified flexible cement with wear resistant, UV protective resins. • Easily installed by one person with minimal preparation required. 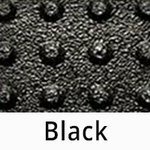 • The only truncated domes we recommend for use on asphalt surfaces, these ADA mats also work great on concrete surfaces. • A pre-molded tactile dome sheet composed of fiber-reinforced polymer-modified flexible cement with flexible, wear-resistant, UV protective resins. • Integrated with the mat is a proprietary "Powerbond" peel and stick technology. • Mats are only 2mm thick with truncated domes 0.9 inch in diameter by 0.2 inch high. • Do not apply in temperatures below 45 degrees Fahrenheit or when surface temperature is below 20 degrees Fahrenheit. • Do not apply in wet conditions or when rain is imminent. • 5 Year Warranty - Meets the ADA requirement for a minimum of five years service. • This ADA Pad Installs in Only Minutes - Save time. Save money. Save yourself a lot of work and frustration. Easily installed by one person with minimal preparation required. Even professional crews are switching from traditional surface mounted and wet concrete cast-in-place ADA tiles to these new ADA compliant surface mount self-adhesive mats! If you have any questions about this product by TRUNCATED DOMES DEPOT, contact us by completing and submitting the form below. If you are looking for a specif part number, please include it with your message.